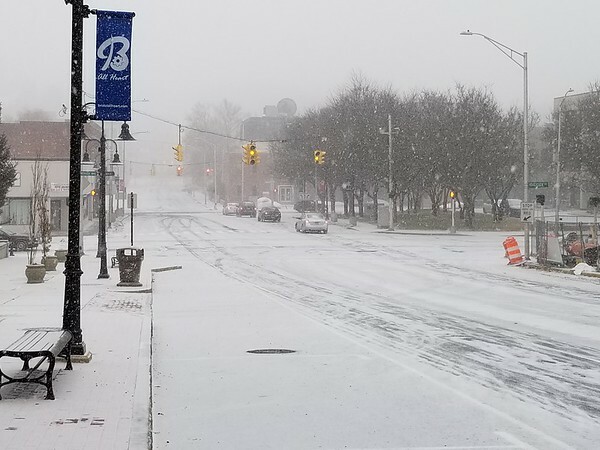 BRISTOL — A winter storm on Tuesday immediately began to cause issues in area towns shortly after the first flakes fell. The snow moved into Central Connecticut around 10:30 a.m. with light flurries that quickly transitioned into a steady snowfall shortly thereafter. One person was taken to Hartford Hospital after a two-car crash on Route 72 westbound in Plainville, near Exit 1, at 11:46 a.m. One of the drivers had to be extricated from their vehicle, with firefighters reporting that they had to cut the roof off of the car. The victim was removed from the vehicle around 12:29 p.m. Police said it is not clear how serious the injuries were. As of 2:30 p.m., the only other report of a car accident in Plainville came when police responded to a two-car crash on East Street. Minor injuries were reported. Almost as soon as the snowflakes began falling, Southington police and firefighters were called to a number of car accidents. The first came at about 10:49 a.m. on West Street, near the I-84 west on-ramp, where there was the report of a motor vehicle accident involving no injuries. First responders could be heard saying the crash caused a five- or six-car pileup in the intersection. “It’s a mess up here,” one emergency responder said, as crews discussed closing the road. Minutes later, Southington firefighters were dispatched to another car crash at the bottom of the I-84 Exit 31 off-ramp. This crash involved minor injuries to at least one person. Emergency responders in Southington were also called to a two-car crash on West Street at about 11:18 a.m., involving the report of no injuries, and to the report of a vehicle that left the road and ended up in the median on I-84 eastbound, between Exits 29 and 30, at about 11:46 a.m. Early in the afternoon, only one motor vehicle accident had been reported in Bristol, involving no injuries. Plymouth police also reported a quiet morning and early afternoon, saying at about 2:30 p.m. that they had only responded to a single two-car crash involving no injuries. Meteorologists expect anywhere from 3 to 6 inches of snow to fall in Central Connecticut, which will be followed by sleet, possibly freezing rain and then rain. Schools in Bristol, Southington, Plainville and Plymouth were closed Tuesday because of the storm. The snow is expected to change over to a wintry mix by about 4 or 5 p.m. Police have urged commuters to take it slow and leave extra space between them and the vehicle in front of them. Parking bans are in effect in Bristol and Southington on Tuesday. In Bristol, the city council meeting scheduled for Tuesday has been postponed to Wednesday. Posted in The Bristol Press, Bristol on Tuesday, 12 February 2019 06:30. Updated: Tuesday, 12 February 2019 17:15.